CINCINNATI — Matt Harvey pitched six innings of one-run ball for his first victory with Cincinnati, and Scooter Gennett hit his fifth grand slam over the last two seasons, leading the Reds to a 7-2 victory over the Pittsburgh Pirates on Tuesday night. Harvey (1-2) gave up three hits in his third start for the Reds, who acquired him from the Mets for catcher Devin Mesoraco on May 8. So far, he’s making good on his second chance, throwing more pitches in each outing as he gets back into form after being relegated to the Mets bullpen. The Pirates loaded the bases in the first inning with the help of a pair of walks, but Harvey escaped the threat by fanning Colin Moran for the first of his five strikeouts. Moran hit a solo homer in the fourth. Harvey has thrown 55, 77 and 93 pitches in his starts for Cincinnati. He has yielded four runs and 11 hits in 14 innings. Gennett led the majors with a club-record four grand slams last season. He got his first of this season off Jameson Taillon (2-4), connecting in the fifth inning. Taillon hasn’t won in eight starts since he threw a one-hitter to beat the Reds on April 8 at PNC Park. 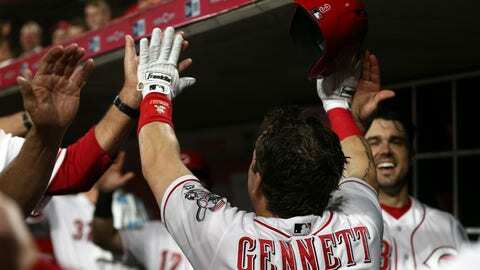 Gennett also had an RBI double in the first inning and a sacrifice fly in the seventh for a season-high six RBIs. His career high is 10 RBIs during his four-homer game against St. Louis last June 6. Cincinnati called up utility player Brandon Dixon, who had never played in the majors, and optioned infielder Rosell Herrera to Triple-A Louisville. Herrera batted .154 in 11 games with no homers or RBIs. Dixon pinch-hit and flied out. Pirates: CF Starling Marte (strained right oblique) is accompanying the team on its trip. He’s eligible to be activated from the DL on Saturday. Reds: RH Michael Lorenzen worked out with the Reds pregame and is expected to be activated before Wednesday’s game. He has been on the DL since spring training with a strained right shoulder. He pitched two innings Sunday in a rehab appearance. Pirates: Chad Kuhl (4-2) is 3-1 in his last six starts. He’s faced the Reds once this season, getting a no-decision in Pittsburgh’s 7-4 loss on April 7. Reds: Homer Bailey (1-6) lasted only 4 2/3 innings during a 5-2 loss in Pittsburgh on April 5. The Reds are 1-9 in his starts this season.